It is estimated that 10% of burglaries in West Yorkshire are conducted purely to get hold of car keys in order to steal your car. This can also be known as a ‘creeper’ burglary (where they literally creep in just to steal a specific item and leave). Cars are often stolen to order and then used in criminal activity, sold on or stripped for parts. VW, Ford, Vauxhall and Audi are common makes that car thieves target so your car could potentially make your home a target for burglary. There are a number of security measures you can take to try and prevent this happening, related to both your car and your home. Car thieves will be looking out for the right kinds of car to take so having yours sat on a driveway or outside your house automatically makes it vulnerable. If you can keep your car in a garage it not only makes it harder to take but keeps it out of sight. For extra security, make sure all doors to the garage have good locks and are kept locked or even have it added on as a zone on your burglar alarm (and make sure it’s armed when the car is in there. If you can’t keep your car in a garage but have a drive, consider having a lockable gate installed and make sure you keep it locked when your car is there. This may seem like an inconvenience if you’re in and out all day but just remember that thieves don’t always come at night. If your car doesn’t already have one installed, have an alarm and immobiliser fitted. Not only will this make it harder to steal, it may also lower the cost of your car insurance. Use security lighting to keep the area well-lit and don’t leave tools or items around that can be used to break into the car (or your home). How many of us have a pot by the door where we throw our keys when we come in? If this can be seen from outside it makes a very easy target for a thief. Even if your keys can’t be seen from outside, it’s still a good idea to keep them out of sight generally just in case someone tries their luck anyway. 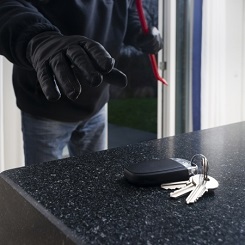 Sometimes thieves will break in even if your car isn’t there in order to steal spare keys and come back later so keep them somewhere safe (ideally IN a safe!). If you have a burglar alarm make sure you set it when you go out and on a night. You would be surprised how many people who have an alarm don’t actually bother to set it (approx. 34%). It literally takes a few seconds to enter a house, take what you need and leave again. 30% of burglaries are classed as ‘insecure’ (via an unlocked door or window) and 30% happen while there is someone in the house. While stolen cars will usually be replaced by insurance it can leave you without a car in the meantime and you will lose any items that you have in the car as well. For many, a car is their pride and joy and has a certain amount of sentimental value that can’t be replaced. If you need any further information on keeping your house or your car secure you can call us on 0345 833 5543, send us a message or come and see us in our security shop in Wakefield.